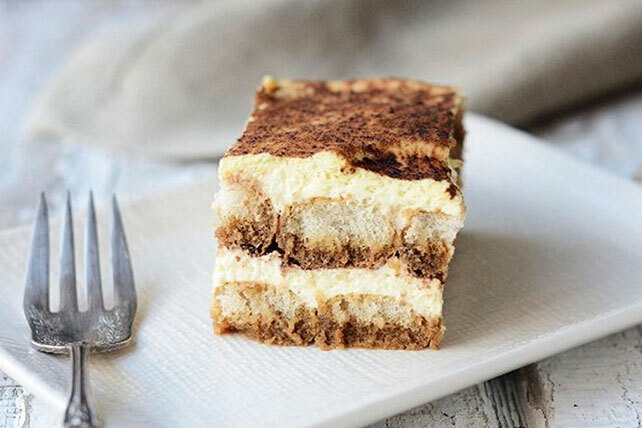 What makes this luscious tiramisu recipe so easy? Try six ingredients and 15 minutes of prep time. Beat cream cheese and sugar in large bowl with mixer until well blended. Gradually beat in whipping cream; continue beating 3 to 4 min. or until thickened. Dip half the ladyfingers, 1 at a time, into 3/4 cup coffee in shallow dish; place in single layer on bottom of 8-inch square pan. Top with half the cream cheese mixture. Repeat with remaining ladyfingers, coffee and cream cheese mixture. Refrigerate several hours or until chilled. Sprinkle with cocoa powder just before serving. Enjoy this dessert with a hot cup of MAXWELL HOUSE Coffee.